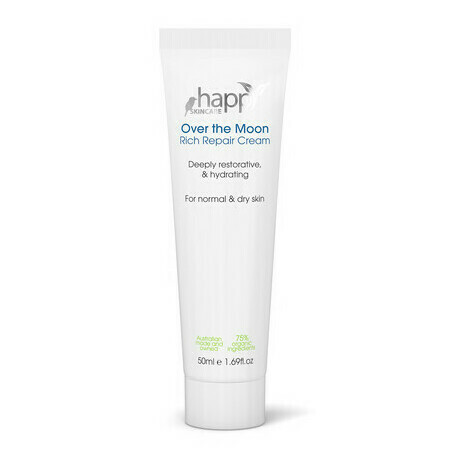 The Happy Skincare 'Over The Moon' Rich Repair Cream really does make you feel over the moon when you use it! This is a deeply moisturising, lusciously rich, daily face cream for dry and sensitive skin types. 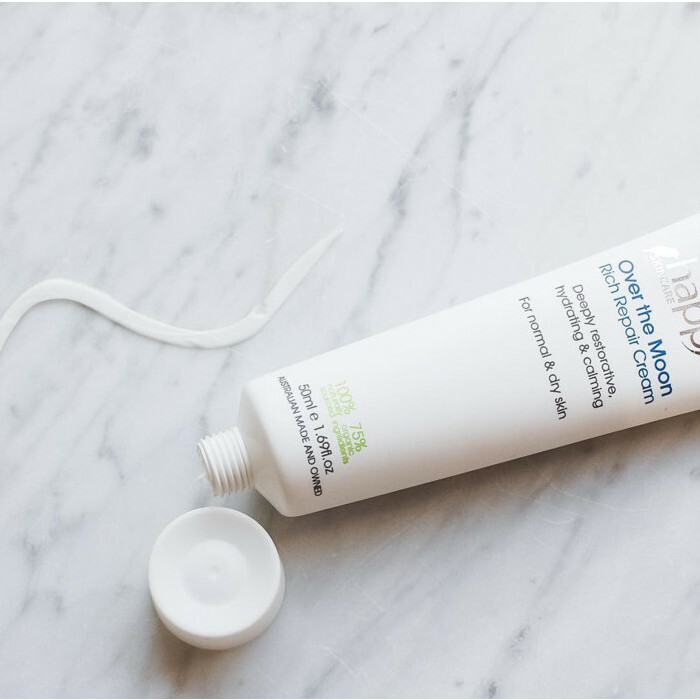 Non-greasy and quickly absorbed, it is also suitable for those with normal skin looking for an extra hydration boost, making it an excellent overnight treatment. This beautiful natural treatment cream contains the beauty mineral MSM (methylsulfonylmethane), which is an organic sulfur compound naturally derived during the earth’s rain cycle, and known to radically improve skin health. The inclusion of Vitamin B3 makes it a great option for those uneven skin tone and pigmentation. It also includes Vitamin E, Rose Otto, Shea Butter and Kakadu Plum, which work together to help hydrate, firm and smooth your skin, and prevent moisture loss. Due to the moisturising properties of this cream, you may also find it provides relief from the symptoms of common skin conditions such as mild forms of dermatitis. Made in Australia, Naturally sourced, Certified Vegan, Certified Cruelty Free. Aloe Vera, Jojoba Oil, Rose Otto, Shea Butter. You only need a little bit of product for intense moisturisation. Apply to your face after cleansing and toning.